“A little guilt goes a long way.” Bleak, disturbing and uncompromising, The Machinist is not necessarily a “feel-good” movie but it has definitely evolved into somewhat of a cult classic over the years. 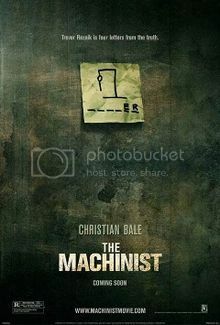 Directed by Brad Anderson, this psychological film features Christian Bale as the title character – a frighteningly gaunt industrial worker named “Trevor Reznik” who suffers from chronic insomnia and starts experiencing extremely paranoid visions, while totally alienating his co-workers with his strange behavior and emaciated appearance. One of the “highlights” of the film is the Route 666 funhouse ride: “You’re going straight to hell on Route 666!” Jennifer Jason Leigh portrays a prostitute named “Stevie.” Several references to Fyodor Dostoevsky can be found in the film. Useless Trivia: Bale reportedly lost 62 pounds for the role, dropping his weight to 120 pounds (the filmmakers prevented him from reaching his goal of 99 pounds due to health concerns! ).